Explanation: First came the trees. In the town of Salamanca, Spain, the photographer noticed how distinctive a grove of oak trees looked after being pruned. Next came the galaxy. 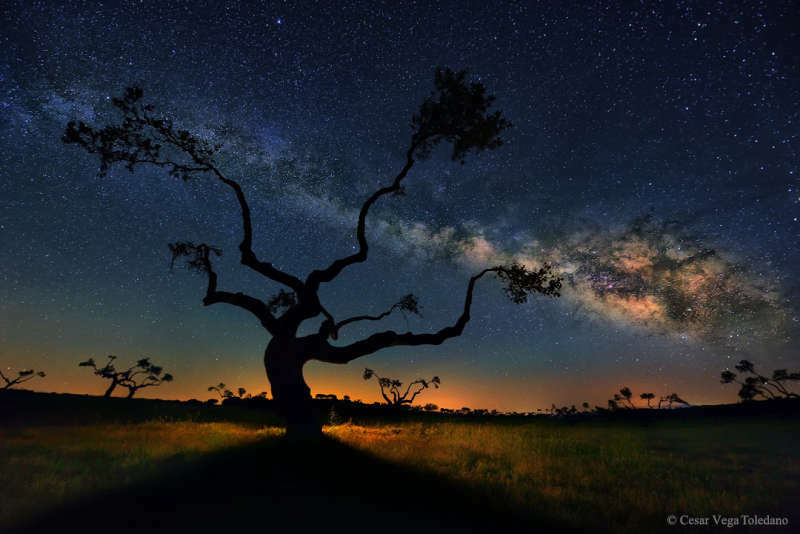 The photographer stayed up until 2 am, waiting until the Milky Way Galaxy rose above the level of a majestic looking oak. From this carefully chosen perspective, dust lanes in the galaxy appear to be natural continuations to branches of the tree. Last came the light. A flashlight was used on the far side of the tree to project a silhouette. By coincidence, other trees also appeared as similar silhouettes across the relatively bright horizon. The featured image was captured as a single 30-second frame earlier this month and processed to digitally enhance the Milky Way.